Lucy Li, at 11 the youngest qualifier for a Women's Open, missed the cut last year with rounds 78-78, but, still, the ice cream was great. Lucy Li won't turn 13 for another three months, and during a phone interview punctuated with laughs and giggles, it showed. "The food!" she said when asked what stands out most about playing in the 2014 U.S. Women's Open. "The food was great, and they had lots of dessert." That was one of the most memorable images of the golf season: Li casually eating an ice cream bar, standing on a box so she could reach the microphone, as she talked to reporters after playing the first round at Pinehurst No. 2 Course. There were worries that Li -- then 11 and the youngest to play in the championship since qualifying was instituted in 1976 -- would be overwhelmed by a big moment on a big golf course. But there were no meltdowns, just a pair of plucky 78s that for her age and size -- she was generously listed at 5-foot-2 -- was quite an accomplishment. There were worries beforehand, but Lucy Li was anything but overwhelmed by the moment. "She looks 11," said one of the professionals in her grouping, Catherine O'Donnell. "She doesn't talk 11, and she doesn't hit the ball like she's 11." If not for one lousy hole during her qualifier in May for this week's U.S. Women's Open at Lancaster (Pennsylvania) Country Club, the precocious Californian who captivated many with her game and personality, might well be back for an encore. Li shot 76-71 at Serrano Country Club in El Dorado Hills, California, her first round stained with a quintuple-bogey on the par-4 third hole. "On my second shot, I hit maybe a half-club too short and my ball hit in the bank of the water," Li said. "Then I had some bad decision-making so I got a 9. It was very unfortunate. I shot 2 under for 35 holes. If it wasn't for that hole, I probably would have made it pretty easily." Despite the disappointment of failing to qualify for her second Open -- "I will be watching on TV," she said -- it has been far from a lost year for Li. With partner Kathleeen Scavo, 17, Li qualified for the inaugural U.S. Women's Four-Ball Championship this spring at Bandon Dunes on the Oregon coast. The pair then qualified for match play and advanced to the Round of 16. "That was such a good experience," Li said. "I'd never played a course like that, and it was really windy the first two days. It was blowing about 25 miles an hour the first day, and I shot 68 with seven birdies. I didn't make a putt over five feet, but I chipped in once." 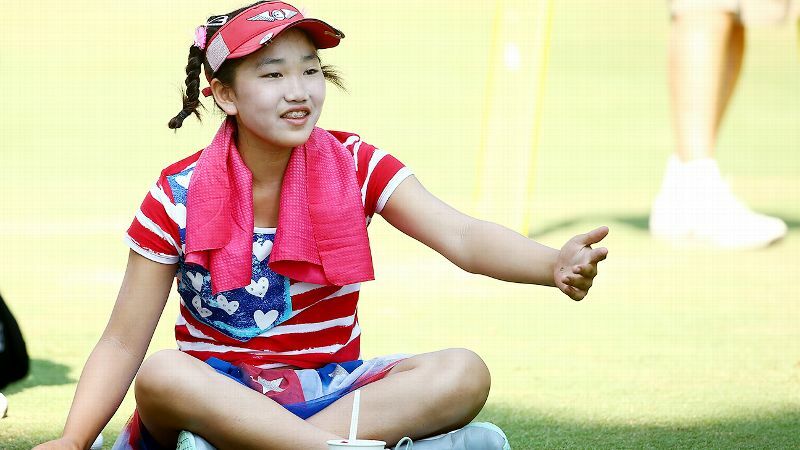 Last month Li won a 36-hole Junior Tour of Northern California event -- beating 16-year-old Xinying Wang in a playoff -- to earn a berth in the Junior PGA Championship. Shooting a 70 on June 30 at Sequoyah Country Club in Oakland, Li qualified for the U.S. Girls' Junior July 20-25 at Tulsa (Oklahoma) Country Club. "I could have shot even lower," Li said. "A lot of putts were right next to the hole." The U.S. Girls' Junior will be the fifth different USGA championship for Li, who in 2013 became the youngest to qualify for the U.S. Women's Amateur and youngest to advance to match play in the U.S. Women's Amateur Public Links. I think Lucy can do anything she wants to. You can tell someone who is really talented very fast -- how much of a gift they have in hand-eye coordination, absorbing technique, being able to hit the ball far enough ... She's got everything. "I think Lucy can do anything she wants to," said Jim McLean, the Miami-based instructor who developed Cristie Kerr and Lexi Thompson into LPGA players and coached Li for three winters beginning when she was 7. "You can tell someone who is really talented very fast -- how much of a gift they have in hand-eye coordination, absorbing technique, being able to hit the ball far enough, their talent for work and if they want to put it all together. She's got everything." Since playing in the Open, Li has gained two Hall of Fame mentors. Mickey Wright, the 82-time LPGA winner who turned 80 on Valentine's Day, communicates her golf wisdom through e-mails to Li. "She's so great," said Li. "I'm very lucky and humbled to able to learn from such a legend. Her swing is so amazing, very pure and powerful. Mickey has taught me a lot of different tricks and strategy." One day last week Li had just had a lesson with 1973 U.S. Open champion Johnny Miller at Silverado Resort and Spa in Napa, California. "I've seen him a few times," Li said of the 68-year-old NBC golf analyst. "He has taught me a lot of different shots for different situations. He definitely knows his golf. With the help of Mickey and Johnny, I think I've improved a lot in a year. I'm definitely better." Li's current USGA handicap index -- plus 4.6 -- backs up her assertion. Now 5-foot-3 and 100 pounds, she is a little taller than she was last summer and drives the ball 230 yards. The 2014 Open raised her profile. She received congratulatory letters, now framed in her room, from House Speaker John Boehner and U.S. Representative Jackie Speier. "Sometimes people recognize me, but I haven't played that many tournaments," Li said. "At the U.S. Girls' qualifer, there were a lot of people from the media following me and interviewing me. I'm okay with it." She was featured in a first-person account in the April edition of Golf Digest, offering a grow-the-game suggestion among her observations on life and golf. "If you want to get little kids hooked on golf, make sure they get to be with their friends," Li wrote. "They'll for sure have fun that way. Grown-ups are fun to play with, too, but when it comes to golf, there's no substitute for kids being around people their age." Li seems hooked, seems to be enjoying herself. After missing the Open cut, the little kid stuck around to watch the grown-ups play. "She loves golf, has a beautiful swing and is super smart," McLean said. "I sure had a good time working with her. With young phenoms, it's always interesting to see how they progress. It's going to be fun to watch." A former senior editor at Golf World, Bill Fields has covered more than 150 major championships in men's, women's and senior golf. His work has appeared in The Best American Sports Writing.